Mix all ingredients for the marinade in a large mixing bowl. Add chicken pieces and toss together. Marinate the chicken for 1 hour. Boil about 6 cups of water in a large saucepan. Add salt, bay leaf, caraway seeds and garam masala into the water. Add rice and cook until the rice is half cooked, stirring occasionally. Remove saucepan from the stove and drain the rice. Discard bay leaf. Place the marinated chicken on the bottom of heavy bottomed dutch pan (preferably cast iron). Layer one half of the semi-cooked rice on top of the chicken. Sprinkle chopped mint, cilantro and fried shallots onto the rice. Cover with the rest of the rice. Drizzle ghee and saffron water onto the rice. Cover the pan with the lid. Make sure that it's airtight (use kitchen towel to seal the edges, or if you're ambitious, you can use cheap canned bread dough, roll it and seal the edges of the lid with it). Cook over high heat for about 5 minutes, the reduce the heat to medium low. Continue cooking for about 20 minutes, or until the chicken and rice are done. Remove pan from the stove, let it sit for about 10 minutes before opening. To serve, mix the chicken and rice in the pan, then transfer to the plates. Serve warm. 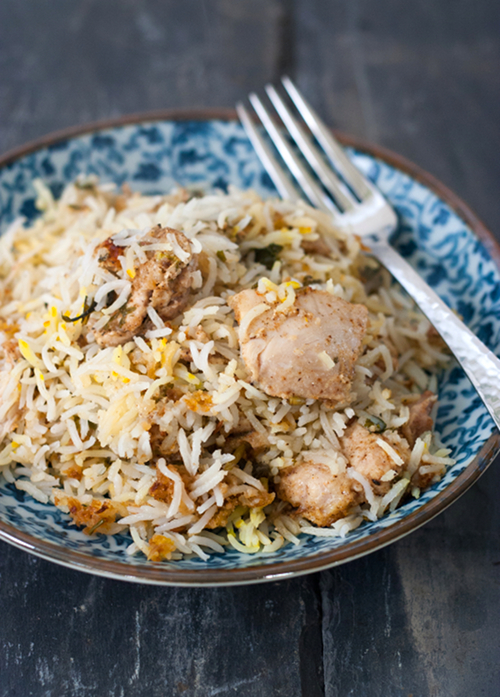 And thanks for your chicken biryani recipe and photo! I am on Facebook and Pinterest too!